The Executive Secretary performs a variety of routine and complex clerical, secretarial and administrative work in keeping official Town records and providing administrative support to the Town Manager and the Board of Selectmen. Oversees the Municipal Building custodian. High school diploma or GED equivalent with specialized course work in general office practices such as typing, filing, computer technology, and two (2) years of experience with progressive, increased responsibilities, and/or any equivalent combination of related education and experience. Experience working in a municipality or other governmental entity preferred. Excellent writing and verbal communication skills. Adept in the use of the Microsoft Office suite of products including Word, Excel, Outlook, and database software. Copy machine, postage machine, fax machine, and calculator experience required. Excellent interpersonal skills, including ability to meet with and effectively serve the public while simultaneously navigating stressful situations. Ability to multi-task. 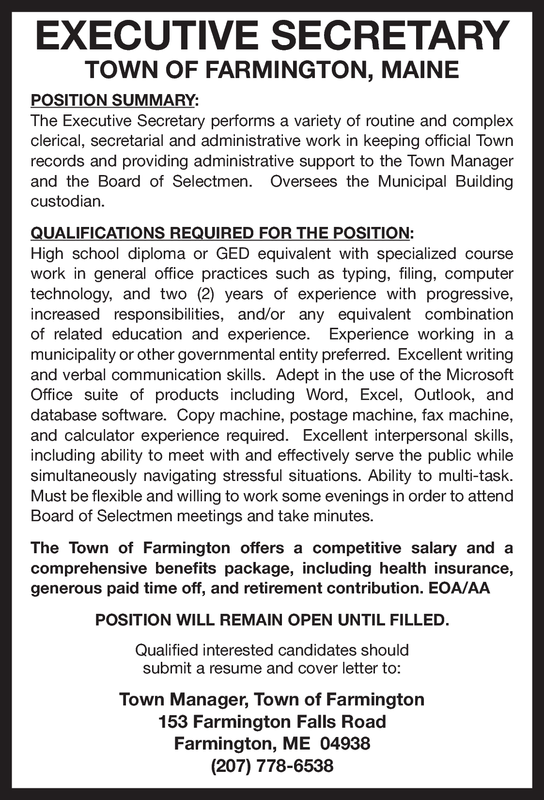 Must be flexible and willing to work some evenings in order to attend Board of Selectmen meetings and take minutes.